Granite is one of the most durable stones you can use in your home. It is virtually scratch proof and, withstanding temperatures up to 1200 degrees Fahrenheit without damage, this stone can take the heat. It accepts a brilliant polish and is available in nearly every color and tone imaginable; no two slabs of granite are the same. Able to handle significant weight and wear, this stone is often used for kitchen and bathroom countertops, window sills, fireplaces, shower surrounds, and monuments. Occurring naturally, granite is formed when magma slowly crystalizes underground. It is the most abundant igneous rock found at Earth’s surface. The main minerals in granite are quartz and feldspars. Measuring 6 to 7 on the Mohs Hardness Scale, a scientific measure of the resistance of a material to being scratched, it is proven to be a durable, beautiful interior design component. Though slightly porous, granite is generally not affected by acids found in lemons, vinegars and cleaning products. But, for this reason, and for sanitation and food safety purposes, when used on most surfaces in the home, granite is sealed. We recommend granite countertops be resealed once a year. To maintain the life of the seal, non-abrasive cleaners are recommended. Because of the multitude of choices in granite, we like to have our clients start by defining a desired color scheme. From there, we’ll walk through the various shades and naturally occurring patterns available. 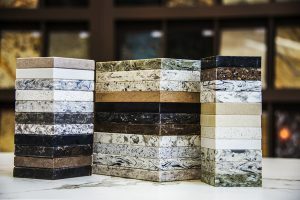 The client is able to choose the exact slab to be used in their home or business, a slab that will truly be one of a kind.